All Sundowner II condos for sale are a hundred yards from the Snowflake lift and nearly ski-in via Four O’clock, which is across the street. The free town shuttle runs continuously through the day to all the peaks’ base areas and stops in front of Sundowner. In the summer, Four O’clock run is a wide trail that leads to the national forest and activities on Peak 8. In 2002, the exterior façade was updated, and the assessment has already been completed. 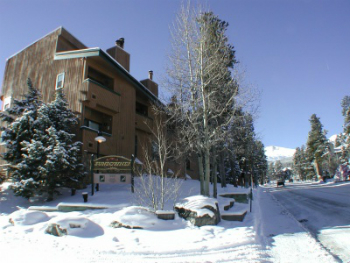 Park Avenue is the western main street of the commercial district of Breckenridge, and Sundowner II Condominiums are less than two blocks from it. Start your search with the available Sundowner II condominium listings below, or find out more about the community. These well-established condos can generate long or short-term rental income because of their convenient location. Sundowner II Condos come in a variety of layouts and sizes in four separate multi-story building. Although they are all one subdivision and share a homeowners association, the two northern buildings are known as Sundowner, and the two southern buildings as Sundowner II. In addition to Four O’clock Run, several trails radiate in all direction from town, and make it easy to start a mountain bike or hiking excursion. Sundowner II is also part of the Upper Village association, which allows homeowners and guests to use the Upper Village pool, spas and clubhouse nearby. Size: 552 sq. ft to 2020 sq. ft. Amenities: Snowflake Lift, across the street from Four O’clock run, close to town, hot tubs, ground level parking. From the Riverwalk Center in the heart of downtown Breckenridge, cross Park Avenue and head west on Four O’clock Road and climb gradually uphill for about two blocks. Sundowner and Sundowner II will be on the left at 465 Four O’clock Road. We love Breckenridge real estate and would love to tell you more about it! Contact us online, or call us at (970) 453-2200.